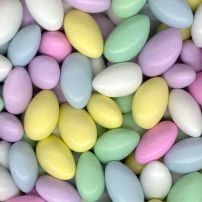 Janiel has chosen these pretty pastel colours and inspired us with the yummy picture below - and the optional extra is EASTER of course. And thank you to our fabulous new sponsor this challenge! I've used my new Tilda for this card, she's coloured with copics and mounted on foam.The papers I've used are from the We R Memory Keepers "Madam Royale" paper pad and the pink polka dot paper is from Echo Park. The sentiment is an SU Stamp and the crochet border is a MFT die. The flowers are a combination of Wild Orchid and Magnolia. I've also used my spellbinders nestabilities ovals and rectangles. All my panels are stitched with the sewing machine. This gorgeous ribbon is also from Wild Orchid - it makes bows so easily as it is lovely and soft! Gorgeous....A beautiful card, and the colours are wonderful. What a fantasic card Sharon!! Nice to play with the pastelcolours. Love yoyr card with this fabulous details !! Hello Dear little Sharon..... I LOVE LOVE LOVE this card!!!! You have used every pastel color in the photo!! WONDERFUL job!!! and your coloring and the details.. oh wow!!!!! Kiitos osallistumisesta ABC-haasteeseen ja onnea arvontaan-aurinkoisia kevätpäiviä sinulle! What a beautiful card!!! It just oozes springtime!! I just love it!! 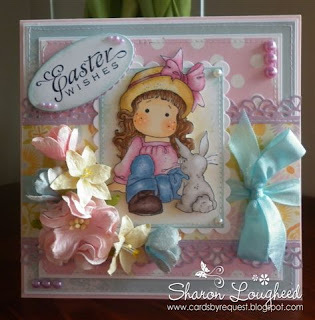 So gorgeous card Sharon,I love the image and the colours. Oh Sharon this is to die for!!! how lovely is it?? I just think it is awesome love it!! Looks Easter all the way with the pretty pastels! 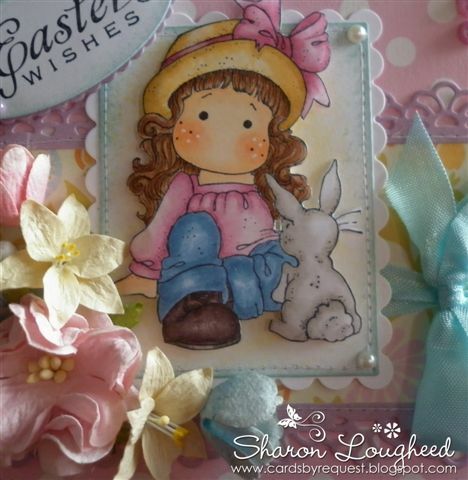 Beautifully colored Tilda and bunny and lovely card layout! Terrific job Sharon! So glad you could join us at Magnolia-licious Highlites...thank you!!! Your card is gorgeous. great colors and layout. your coloring is super too. Your pastel colours are gorgeous - I love the yellow added in there. Its such a happy looking card and you have done a fantastic job with this fortnight's challenge!! Sharon, you are way too talented girlie! This is over the top gorgeous! What coloring skills!!!! Such a pretty combination of all the pastels! Love it! Your cards has beautiful colours and decorations.I love it.